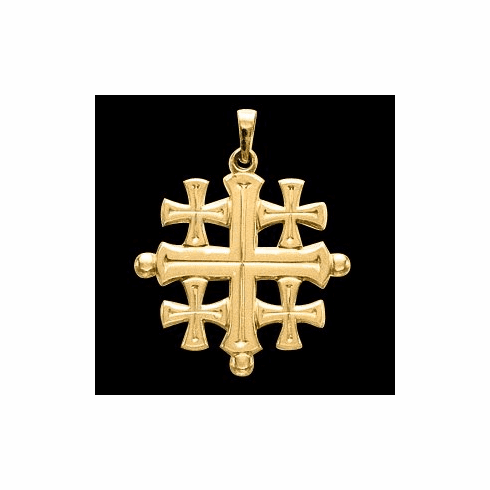 The Jerusalem Cross, also known as the Crusaders’ Cross, was first used in 1099 as a coat of arms, for the newly established Kingdom of Jerusalem. This event marked the recapture of Jerusalem and the Christian Holy Land by the First Crusade. The Jerusalem Cross is comprised of a central cross with four surrounding smaller crosses. It is said that the Jerusalem cross (Crusaders’ Cross), represents Christ and the four Evangelists Matthew, Mark, Luke, and John, and the spread of Christianity from its origins in the Holy Land to the four corners of the earth.